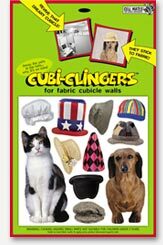 With Cubi-Clingers, office workers everywhere are transforming those pesky, useless cubicles into canvases of self-expression. Just pop out the pieces and slap them onto the first fabric wall you see. Behold the miraculous transformation! We're totally NOT exaggerating! Our Alphabet collection is the perfect tool for passive-aggressive communication with superiors, subordinates, and everyone in between. The charmingly irritated dog and cat are happy to model hats for you as you slave away the day. Remember, no one can resist a weiner dog. NOTE: For orders outside of the USA, you will be invoiced for any additional postage costs that exceed our flat shipping rate. 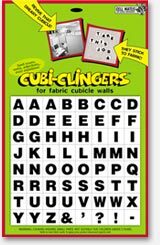 A fun novelty office toy for fabric cubicle walls! Decorate your cubicle and express your true feelings! Makes a perfect office gift!